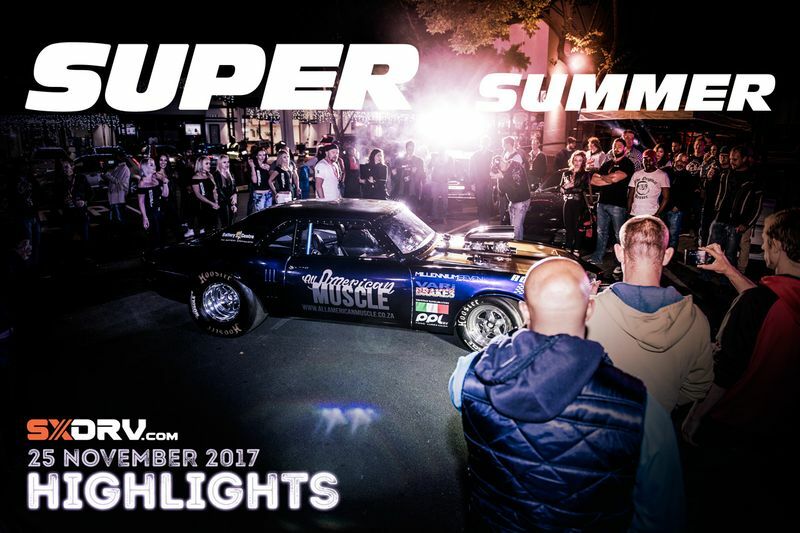 Home / Automotive / Cars / Video: The Sxdrv Super Summer Party Highlights! On the 25th of November 2017, SXDrv hosted our second event of the year, the SXDrv Super Summer, with Billy the Bums providing the setting for what was one incredible evening. Those of us with petrol flowing through our veins were treated to a load of amazing cars. The guys at Creative Rides provided us with some old-school classic American muscle, while Millenium 7 brought us back to the future with the latest versions of those classics. All pandemonium broke loose when All American Muscle arrived with a flame-spitting super modified Camaro, testing the limits of our eardrums. We also had a host of privately owned metal on display too, from a modded RX-7 to a Porsche 911, a 2016 Shelby Cobra, a super-clean and powerful Nissan 300ZX among many others. There was even a fully kitted Jeep Wrangler with wheels almost as large as some of the cars were high. For those that prefer two-wheels, Rim & Rubber brought through two bikes they're modding for clients and Reconstructed Bikes showcased three heavily modified rides, including a Dragster sporting a massive 2,6-litre motor pumping out more power than we have space here to write. And no SXDrv party would be complete without the gorgeous ladies, some of whom you have seen in previous shoots, and others you'll get to see in future ones! Ultimately, it was a high-octane evening of cars, girls, dancing and fun! Check out the gallery above and video below to see what all the buzz was about, and don't forget to leave us your thoughts in the comments too. Keep your eyes peeled for the next one early next year so you can come join us and don't forget to follow us on Facebook for all the latest news and updates on what we're up to. 2018 is going to be one epic ride!